Also known as fuel filters, these compact devices are among the most integral parts of any engine system, be it carbureted or electronic fuel injection. Located along the fuel lines in the engine compartment or vehicle undercarriage, gasoline filters are employed in transport, marine, shipping, petrochemical, automotive and avionics industries. Manufacturing processes in these applications or simply the engine operation can produce byproducts such as metallic chips, dust and emulsified water, which are easily introduced into a fuel supply. Environmental exposure also leaves gas susceptible to additional contaminants such as dirt and dust. Excess amounts of these impurities can be extremely damaging to an engine and, if left unfiltered, can lead to mechanical failure. In a gas filter, gas is run through a semi-permeable material that captures contaminants while allowing the fluid to pass. Liquid filters are essential engine components that boost fuel efficiency while mitigating pump and engine wear as well as injector and hose clogging. Exhaust filters can also serve to lower vehicular emissions, which are strictly monitored in some industries and states. As with all liquid filtration systems, gas filters may become clogged or degrade over time. Proper maintenance and regular replacements ensure continued fuel optimization. There are two main types of gas filters available. In-line products are positioned at the inlet of the fuel line. The gas is run through a bag filter, cartridge filter, wire mesh, membrane or other semi-permeable barrier as soon as it enters the system. This ensures that contaminants are removed as the fuel continues to flow into the engine. These assemblies are used in engines where the inlet, outlet and filter element are positioned in a relative straight line. Return line, or closed loop filters, however, are positioned at the end of the system to catch those components generated by the operation of the engine or motor. After impurities are removed via similarly designed filters as inline systems, partially processed gas is returned to the system reservoir. 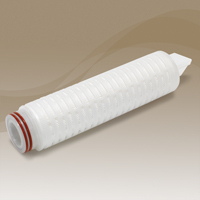 Both filters can be used in low or high pressure applications. Low pressure filter housings such as those used in carbureted engines may be made of either metal or durable plastics, whereas high-pressure electronic fuel injection engine filters must be made of metal in order to withstand the tremendous amount of force behind the up and down motion of the engine’s pump and pistons. Common metals include steel, aluminum and stainless steel. The material construct of the filter media held or contained by that housing is far more diverse. Again, operating temperature and pressure should be considered, but materials such as activated carbon or clay, cellulose, ceramic, fiberglass, paper, nylon, polypropylene and polyester are commonly used. Gas Filters Gas filters remove excess or unwanted debris and solutes suspended in gasoline that would otherwise impede performance and harm valuable engine components.